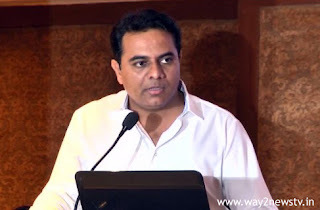 Municipal Minister Keti Rama Rao said the Telangana government is strongly trusted by the decentralization principle and that government schemes will reach the public through decentralization. The diary of the Telangana municipal commissioners was released on Monday at the Secretariat. The municipal has already taken several reforms. Many municipalities and corporations in the state have been allocated a large amount of funds in the history of unprecedented history. There are already 45,000 crore funding through Urban Mission Bhagirath in towns. The government has already made a decision to convert panchayats which are more than 15,000 town panchayats and municipalities. They are also given the money and money. According to these sources, people will be given the rule of governance. In Ziyychi YCC, we are encouraging more circles and zones. The municipal commissioners should play a key role in implementing government reforms. Commissions should work on a special stamp on their working towns. To co-ordinate with the elected representatives of the local authorities. Many of these schemes have come to the crucial stage and work towards completing them. Promotions and promotions of municipal commissioners will be taken to the Chief Minister's attention. The event was attended by Divincial Minister Indra Kumar Reddy and MLA Srinivas Gowd.